It’s time to unveil the 2 shows I have coming up! 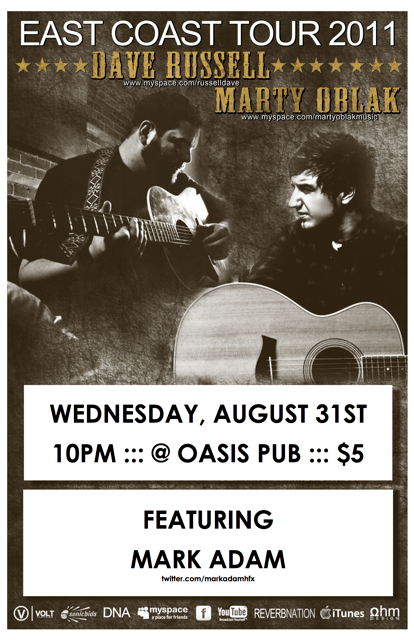 First off, I’ll be opening for Marty Oblak and Dave Russell on August 31, 2011 at the Oasis. They’re on their east coast tour, and I get to be on the bill. Should be fun times! It’s imperative you all help me out on this, as it’s a WEDNESDAY and generally the Oasis doesn’t have Wednesday music… so PLEASE help me spread the word! The other show is only two days after that… Friday, September 2, 2011 at Whiskey’s Lounge on Portland Street in Dartmouth. 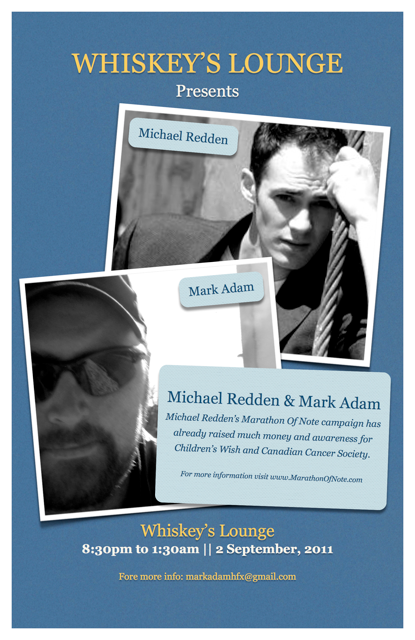 I’ll be performing alongside the Marathon (of Note) man himself, Michael Redden! It’s going to be a great time playing with him again, and should be a lot of fun for anyone who shows up! So there you have it; August 31 and September 2, you can find me and more at the aforementioned locations. I hope that I see you there! Even if you can’t, please spread the word. It’s hard being a musician sometimes, and word of mouth is a very useful thing! Posted in Halifax, Music, Public Profile, ShowsTagged 100 days, 100 songs, august 31, Dartmouth, Facebook, Halifax, live, lounge, marathon, marathon of note, Mark Adam, michael redden, Music, poster, red, september 2, Show, whiskey's lounge, zippyBookmark the permalink.